In addition to all the normal rigors of the coursework associated with studying computer science in the United States, many international students are hoping to secure valuable internships to both further enrich their study abroad experiences as well as establish themselves with some potential future employers. Computer science internships are truly integral parts of a robust computer science education from an institution in the United States. These internships help students and new graduates become actively involved in the industry, gain first-hand experience related to their future careers, and establish both a reputation and network amongst potential employers. Those international students interested in a computer science internship during the school year or during the summer will have many more steps to take than a US citizen applying for the same positions. This article will help identify a few tips to help the seemingly daunting process of securing a computer science internship easier to navigate, as well as provide resources for international students. The first step to securing a computer science internship is to make sure that you have governmental authorization as an international student. It is important to check with your international student advisor to make sure that you have the ability to work – especially if you will be receiving compensation. Next, an international student should apply for any number of internships that fit their desired criteria…the more, the better. Many students apply to at least 12 internships to find that perfect one, and an international student should apply to far more than that if they really want to ensure that they get a computer science internship. Most computer science programs in the US will offer their students internship opportunities through their department. These departments will likely have information on their websites regarding the internship opportunities and requirements. You may also find that speaking with faculty members may give you an advantage in both finding and securing internship opportunities. If you are interested in a computer science internship beyond those offered by your host institution, there are other routes available. Though, all international student internships must conform to the federal guidelines of Curricular Practical Training (CPT)	and Optional Practical Training (OPT), internships held by international students must be tied to some form of course credit. International students can still submit their resumes and cover letters directly to businesses and companies with which they would be interested in interning. These companies will often consider the resumes of international students and will typically work something out with their hosting institution for credit—even though the computer science internship was not secured through their school. Apple Internships—based out of Santa Clara, California, Apple has a searchable database of open positions and internships interested international students should consider examining. Microsoft Internships—based out of Redmond, Washington, Microsoft internships are a great way to get a foot in the door of one of today's industry leaders. Microsoft interns are given a large degree of responsibility and actively participate in projects with full-time employees. Google Internships—with internships available in California, New York, Phoenix, and Seattle, Google is another great company for international students pursuing computer science internships to explore. Google interns are given similar responsibilities to full-time employees as well as the opportunity to participate in cutting-edge projects. International students hoping to intern with Google should mind their GPA—Google places much emphasis on the academic performance of potential interns. Oracle Internships—based out of California, Oracle offers its computer science interns high wages and free housing in corporate dorms. Oracle typically hires around 40 interns per summer, with applications being due by February 15th. However, Oracle only offers internships to graduating computer science students (though, receiving one is an excellent start to a great computer science career). An internship is a tremendously important part of a robust computer science education. These basic reminders and listed internship resources will help international students navigate the sea of potential computer science internships and computer science summer internships from which they will have to choose. Learn more about studying computer science in the USA by reading our growing article collection. « Study Guide by Subject	« Study Computer Science in the U.S.
Over time we will be updating this section and including more information for those who want to study computer science in the USA and for other countries, but please feel free to post your thoughts and comments on our Facebook fan page, and also follow us and post questions through Twitter. 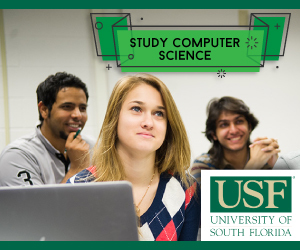 Visit the Study in the USA School search to find schools that offer programs of study in Computer Science.